Talk about your timing! Mere hours after we rant about amiibos, Lego jumps in the fray with a new launch trailer for Lego Dimensions, a cross-license game that involves buying collectible minifigs that come with DLC. 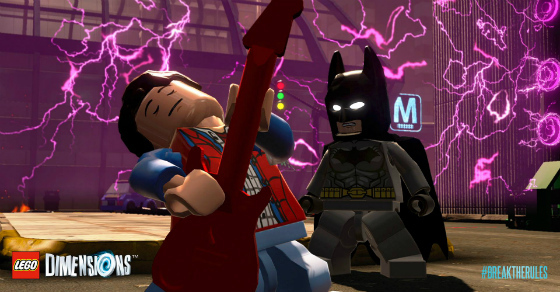 Starring Gandalf, Batman and Wyldstyle from The Lego Movie. And already including The Wizard of Oz, Ninjago and Back to the Future as additionally announced licenses – with a hint of Ghostbusters to come. I’m guessing you won’t see Marvel characters alongside DC, but other than that, presumably the possibilities are as open as in The Lego Movie itself. You can bring up to seven characters into the game at once – for $99.99, the starter pack comes with dimensional portal, mini-Batmobile, and the three aforementioned lead characters (curiously, Gandalf and Wyldstyle sound like their respective normal voice actors, while Batman does not – you wouldn’t think Will Arnett would be the heard one to get). So yeah, this collectible figurine DLC trend is only going to get worse, y’all – it’s the ’90s collectible comic cover market all over again. At least Lego toys will always be compatible with one another, so you have something left at the end of all of it.